Have you ever considered soundproof blankets? These can be a great option if you want to design a small audio-recording studio, launch a YouTube channel, or deal with noisy neighbors effectively. In all these situations the sound-proof blankets can be a plus. Before shopping for these Acoustic Blankets, it’s important to know the basics. That includes the form and function of these blankets, the main benefits they provide, and which features you should consider before selecting a particular unit. I will be reviewing these issues as well as some of the top blankets on the market. This will give you the best chance to select the right unit for your wants and needs. Are you ready to get started? How to sound dampen your door with a blanket. The Best Soundproofing Blankets For Doors. 2. Use Weather Stripping For Doors. Can You soundproof a door with moving blankets? These items are also known by other names like Sound Barrier Blankets, but they have the same functionality. Let’s get to the nitty-gritty of what these blankets are all about. The first thing to note is that while it’s possible to fully sound-proof anything including a room the price tag is sky-high. A more accurate term for these blankets is sound dampening/deadening. These blankets are among the items that are effective in reducing the sound in a room. It’s critical to know when you should consider using Sound Blankets and when other options are more practical in your home or workplace. For example, let’s say you’re working in a room with lots of hard surfaces but few furniture pieces. This allows the sound to bounce around a lot between the floor, walls, and ceiling. The key is to slow down the sounds, and Moving Blankets are a good option. If you add a sound-proofing blanket to 1+ of these surfaces, it can help to reduce the total sound in the room. That can help you focus on your work like audio recording. The most effective way to soundproof a roof is to do various types of construction. There’s a caveat. These costs can be quite high depending on how much soundproofing you want to do. Another factor is in situations like renting you’re not permitted to do that kind of construction. In fact, if you did, you could end up in a world of trouble. Don’t worry! Sound-absorbing blankets can decrease sound by up to 80%. So in terms of return on investment, these blankets offer high value. The key is to pick the right units then place them effectively around the room. These black/grey moving blankets are bundled in a 4-pack. The fabric is non-woven, and the pattern is zig-zag, and the binding is polyester. The professional blankets can double for sound-proofing. This option is much cheaper than other moving blankets on the market and especially vs. construction required for standard sound-proofing. These blankets can also be used when moving by wrapping furniture/appliances. This protects them from dirt, scratches, and moisture. These Sure-Max Moving/Packing Blankets are oversized and professional-quality. This provides good damage protection from dirt, scratches, nicks, and moisture. You can use the blankets for moving items like furniture and appliances. The blankets offer thick/padded cotton batting and polyester binding. The thickness makes the blankets a good option for Sound Blankets. The units are made from quality materials. The blankets are durable with zig-zag stitching to keep the cushioning in place when using the blankets for moving for sound-proofing. These units are built to last. The blankets can also be used for various functions. They include protecting stored items, upholstery, floors, etc. You can also prevent items from sliding across the floor. You can also use them for sound-proofing in home recording studios. The blankets are also effective for long-distance moving. You can protect your fragile objects and keep everything intact when relocating. This makes the items a good investment for protecting your stuff. These Moving Blankets are bundled in a 4-pack of black/white heavy-duty moving planets with dimensions of 72 in. x 80 in. The blankets are about ¼-inch thick and weigh about 7.5 pounds. The blankets are very durable with a quality cotton/polyester blend. The filling is made of recycled cotton and is located between 2 quilted layers. This adds more functionality when using the blankets for soundproofing. You can machine wash the blankets and hang them up after using them for various functions. This keeps the items fresh and clean. Another plus is the 3-inch winding prevents the blanket from unraveling when machine-washing the blankets. There’s also zig-zag stitching for the quilted overlay. This feature provides a sleek finish for the blanket. As a result, you can use the blankets several times for moving, sound-proofing, etc. The blankets’ thickness and design make them a good option for moving. They’ll help to prevent items from scratching, scuffing, and breaking. It’s important to note that these blankets aren’t specifically designed for sound-proofing. If you need that functionality, you should consider thicker moving blankets or items that are specifically designed for sound-absorption. Another issue is these units don’t include grommets used for hanging up blankets, which is another reason they’re not designed for sound-proofing. These sound-absorption blankets aren’t specifically designed for blocking sound. They have an NRC Rating of 0.85. However, the sheets can help to reduce sound echoes in a room. They’re also a good option if you want to avoid the high costs of sound-proofing using construction. That’s because they require the purchase of foams, panels, tiles, etc. These sound-absorption sheets are a good “green” option. They mostly made of recycled materials, so they leave a smaller carbon footprint. The sheets only weigh about 10 pounds each. So they’re easy to move, hang, etc. The bundled hanging knob/screws make it easy to install the sheets for more convenience. This also prevents the need to buy extra hardware. The blankets’ panels have bound hems for extra durability. The brass grommets are double nick-plated and are located on the top and on ht side edges. The blankets have 20-inch thickness. These items can be used as a sound-absorber or as both a barrier and absorber. It’s important to note that nothing can provide 100% sound absorption. However, this blanket is a good option if you’re looking for an affordable option. The dimensions are 4-feet width, 8-0feet height, and2-inch thickness. The price range of sound-absorbing blankets is quite wide. This has to do with features like a fabric’s quality and thickness. For example, a 2″-thick blanket with fiberglass layers will likely have a steep price tag. That might not be a problem if you want the most sound-absorbing material on the market. If the unit has grommets that will tack onto the total cost. More specifically it’s unwise to cut a soundproof blanket you, so it matches up with a particular area where you want to hang it. Here’s why. Sound blankets are usually quite thick/heavy so there’s a good chance you could accidentally damage the unit by cutting it. Hanging up a perfectly-sized yet damaged Acoustic Blankets is something you’ll want to avoid. A better option is to measure the area where you’ll be installing the blanket. This can help you select a blanket that fits perfectly wherever you want to hang it. The type of fabric you pick is critical. While breathable fabrics are suitable for hot summer nights when you want to block out the sound—not so much. That’s because not only air but also sound can go through them easily. Since sound waves can’t go through these fabrics since they’re slowed/stopped. There are one more issues related to picking a sound-proofing fabric. Something called “grommet” is unrelated to the sound-absorption but makes the process of hanging up the blanket super-easy. These items make it easier to hang sound-proof blankets up on walls/rods. They’re not always bundled with blankets. If they’re not, it’s highly advisable to add them since you’ll likely need to hang up the blankets on hooks/rods at one time or another. You could spend big bucks for Sound Barrier Blankets that are ultra thick and sound-absorption. The problem is these items tend to have a steep price tag. An alternative is to layer blankets like you would clothing. This can exponentially boost the total sound deadening the blankets provide. That, in turn, can make a room ideal for applications like audio recording in which you want to hear minimal noise outside the room. Thicker fabrics tend to offer better sound-absorption. However, you should also consider the fabric’s quality. An X-factor is thicker blankets will be tougher to hang over various surfaces. One key issue to consider when picking sound blankets is they often look dull. That’s generally OK since form should follow function. Eye-catching aesthetics won’t mean much if the fabric absorbs sound as well as flypaper. Before you pick a particular design take some time to consider the function of the blanket. For example, if you want a quieter home to work or study well, then a basic blanket would be good enough. However, if you’re doing sound recording, then highly effective sound dampening is more important. In terms of design one option to consider is a quilted design. This helps to absorb both sound and temperature. So if you’re working in a cold room without a heating system, then this is a good option to consider. Well to soundproof a door with a blanket effectively is really easy and you can do it yourself fast. It doesn’t take a lot of time and really doesn’t cost much. A Measuring Tape for accurately measuring your door. A pair of strong big scissors to cut the blanket to the right size. Tacks or T pins for mounting the blankets on your door. There are many soundproofing blankets that can be used for doors and unfortunately, not all are effective and can be a waste of time, money and effort. I took it as my best interest to find blankets that are proven to work and will definitely help with soundproofing a door. Another thing to note is I haven’t personally used them and unlike other websites that are not honest with you and do reviews just to earn commisions. I really did tons of research to find you the best ones that work and I am 100% confident that these blankets will soundproof your door. After spending hours on research, I found out that only 2 blankets are worth the effort and money. 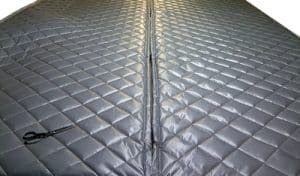 One of the simplest ways to reduce noise coming through your door using this Cover Quilted Microfiber. What makes this great is the fact that it takes less effort to install and looks decent. Another great thing is it covers both front and back side of your door and great for insulation in cold winter days ( Click here to get more info on Amazon). I realized not everyone can easily afford Singer Safety Fiberglass Panel, So I had to find the cheapest solution and using sure-max is a great alternative which is way cheaper. In order to successfully soundproof your door using sure-max moving blankets, you must overlay them to build a number of layers don’t worry this is really cheap and should cost you under $100. Singer Safety Double Faced Quilted Fiberglass Panel is my number one recommendation. It is one of the best( if not the best) soundproofing blanket. It is highly rated and gets a lot of positive feedback from Amazon. I would personally recommend it however it is slightly expensive but worth it, you should expect to get one in this range between $ 200 and $ 300 but absolutely worth every penny. Cut the sound deadening Blanket according to the measurements. Use Tacks or T pins to mount the blanket to the door. After successfully soundproofing your door with a blanket, you will notice that there are still small gaps between the door and the door frame, These gaps shouldn’t be left untreated as noise will exploit them making the whole project a failure. Luckily using weather strips to close off the gaps is very simple and costs less than $20 check the latest price on Amazon here. Measure the gap between the door and frame. Cut the weather strip accordingly. Attach them to close off the gaps. when you are done with this step your door should be soundproofed and noise will be reduced dramatically. I really hope this helped you out a lot and don’t forget to share to help others. One of the things to keep in mind when choosing soundproof blankets is to make sure it is thick and dense enough to help strengthen the sound dampening and reduce noises and sounds. I hope you found this article useful be sure to check some of my other ones.